Everest Base Camp Trek via Gokyo is recognized for the series of beautiful turquoise lakes in the Gokyo valley and the famous Cho La Pass. 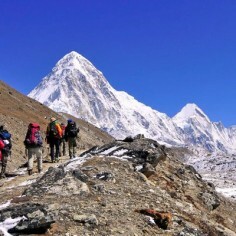 This trek takes us through the Khumbu region in the company of majestically soaring mountains, friendly Sherpas, colorful monasteries, the Namche Bazaar and, of course, to the base of the mighty Everest. This trek will be a lifetime experience with the enthralling sights of Mt. Choyu, Everest, Lhotse, Makalu, Nuptse, Amadablam, Pumori, and Tengboche Monastery – the largest monastery in the Thumb region. This trek is ideal for trekkers who wish to take up more challenge and “stay off the beaten path”. If you are looking for a trekking company to help you through this unforgettable journey of a lifetime, then look no further. Sisne Rover Trekking is here to help and guide you throughout your journey in Nepal. We are a government licensed trekking and travel company in Nepal since 1991. Day 02. Kathmandu – Trek preparation and Free time. We can add Kathmandu Valley Sightseeing tour on your request. Day 17. Fly to Kathmandu. Complimentary Farewell Dinner.